Create your own altered art charms with Lunagirl images! Altered art charms are really hot right now. They're so beautiful and fun, and not as difficult to make as you might think. Many of the people selling bracelets are using Lunagirl images. First, choose your image! I have several sheets of mini images (inchies and craft circles) ready to print and clip out for charms (find those here), but of course you can print ANY of our collage sheets smaller if you like, for smaller pictures (an advantage of digital collage sheets). Being high-quality jpg images (not pdfs) they will keep their image quality at smaller sizes. To make charms it is best to print the image onto fairly thick acid-free paper or photo paper. Any good laser or inkjet printer should do, but many prefer the laser printing for charms because inkjet prints tend to smudge more easily. After printing, place your blank charm setting on the picture and trace around it, then clip out the picture with some good very sharp scissors (it's good to first cut it slightly larger than you want, then trim it down). There are several people selling the metal charm blank settings on ebay. 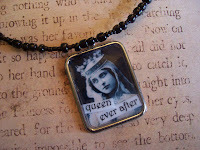 If you search on the phrase "altered art charm blanks" you should find a few. Or, you can buy charm jewelry at discount stores and pop out the existing charms to put in your own pictures! You can also use dominoes, wooden pieces, etc. You can glue the image into or onto the setting with a hot glue gun, or better yet with a good general purpose craft glue, then smooth it down nicely. Be careful not to be too heavy-handed with the glue, or it can get lumpy or messy. A charm is beautiful with just a single image, but you can also add other images or printed words to create a collage. You can even add pressed flowers or other "pressed" items if they are very flat. There are different opinions about which gloss/glaze is best. I prefer a few coats of spray-on Krylon Crystal Clear Glaze because it's easy and it's nice and clear without bubbles. Some people prefer a clear polyurethane you can paint on, as with decoupage. Either way, be sure to let it dry between coats. Try using an old link bracelet, and turning it into something wonderful by adding your own charms and beads! There are lots of bead sellers on etsy as well if you want to add beads. Your local crafts store will probably offer findings (jump rings, clasps, etc.) and jewelry making tools. EVEN BETTER: Find costume jewelry and vintage jewelry pieces at discount stores, garage sales, jumble sales, and secondhand stores, and incorporate them or disassemble them to use on your own bracelets! 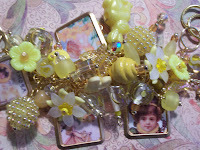 You can also create pendants, clips, even earrings and barrettes. Or add charms to your altered boxes and books. 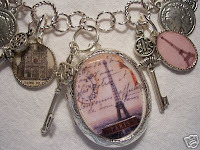 I've seen lovely bookmarks, hip clips, even cell phone jewelry, using altered art charms. For a very simple yet elegant pendant, simply place your charm onto a beautiful ribbon or thin black trim or leather necklace. If you decide to purchase Lunagirl images or collage sheets for your project, please be sure to read our FREQUENTLY ASKED QUESTIONS for useful information. Browse our collage sheets to find mermaids, fairies, Christmas images, romance, witches, charming children, Victorian Edwardian ladies, flappers, retro glamour girls, flowers, castles, tea parties, vintage posters, Alice in Wonderland, text ephemera, and much more! It's all about "altered": Take images and existing items you "find" and use your own creativity and imagination to create something new and unique! An altered art charm bracelet, pendant, or clip you've created yourself is a beautiful gift ~ truly one of a kind and from the heart.